New Bulgarian University participates in the international academic network through various forms of mobility of lecturers and students, through bilateral collaborations, jointly developed projects and memberships in reputable world educational institutions. The membership of the NBU in a number of authoritative international organizations contributes to the alignment of university education with world standards. New Bulgarian University is a member of: The International Association for Semiotic Studies (IASS), The Network of Institutes and Schools of Public Administration in Central and Eastern Europe (NISPA),Association for regional studies (RSA), the European Consortium for Political Studies, Informal European Theater Meeting (IETM), European Theater Association (EAST), European League of Art Institutes (ELIA) and others. Practicing at the NBU are international advisory councils that review curricula, create opportunities for different educational initiatives, and provide international internships to students. 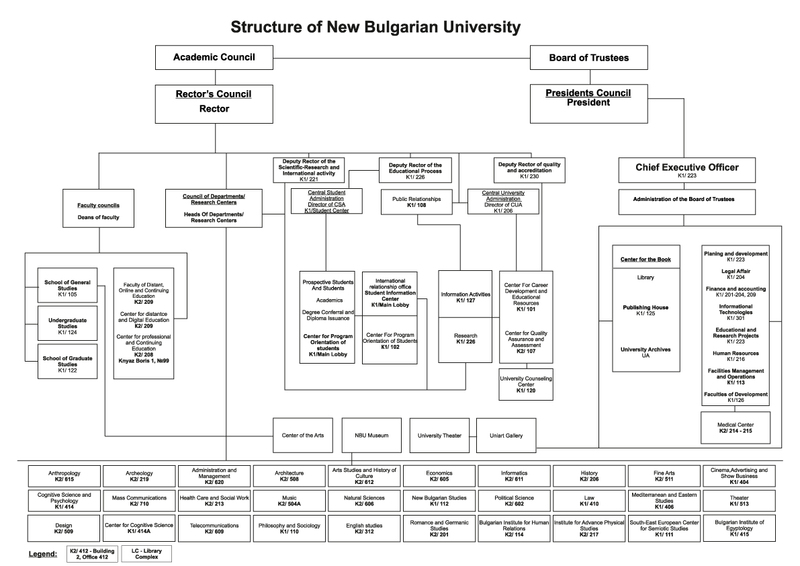 New Bulgarian University is a full member of the Francophone University Agency (AUF), a global organization with a network of multiple educational and cultural institutions in Europe, Africa, Canada and the United States, set up to support development and exchange in various areas of education and culture . The result of this membership is the Francophone branch of the NBU with a bachelor's degree program in Political Science. Membership in AUF provides students and lecturers with the opportunity to increase their education in many academic institutions involved in the francophone network of the agency. The University also works on European Union programs: LIFELONG LEARNING (Erasmus +), TEMPUS, ERASMUS-MUNDUS, and others. New Bulgarian University organizes annual summer international schools on semiotics, cognitive science, mass communications, archeology and theatrical art; master classes in opera singing, piano and harp, jazz improvisations and pop and jazz singing. The NBU is the initiator of numerous seminars and conferences where students meet important scientists and artists from other countries. The strategy for recruiting foreign students is part of the process of internationalization in universities. The NBU's strategy for attracting foreign students is updated annually and supplemented with new proposals and opportunities. More and more programs attract students from abroad who study in Bulgarian, English, French or Russian. The most active searches are from candidates from Nigeria, Pakistan, Syria, Algeria, Cyprus, Greece, Turkey, Macedonia and others.